Hey there, it’s Jake with our monthly installment of Operation Digital Nomad, the post in which I update you on our quest to monetize our travel blog and keep on traveling full time for as long as possible. We have been exploring for over a year now, and this the 9th month of Operation Digital Nomad! In this issue, I’m going to update you on what happened in March, and I’m also going to spend some time talking about Google Images and how we’ve been using it to generate traffic. Because of a little extra effort we put in, Google Images now accounts for almost 40% of our organic search traffic! But first, the bottom line! Not bad, right? 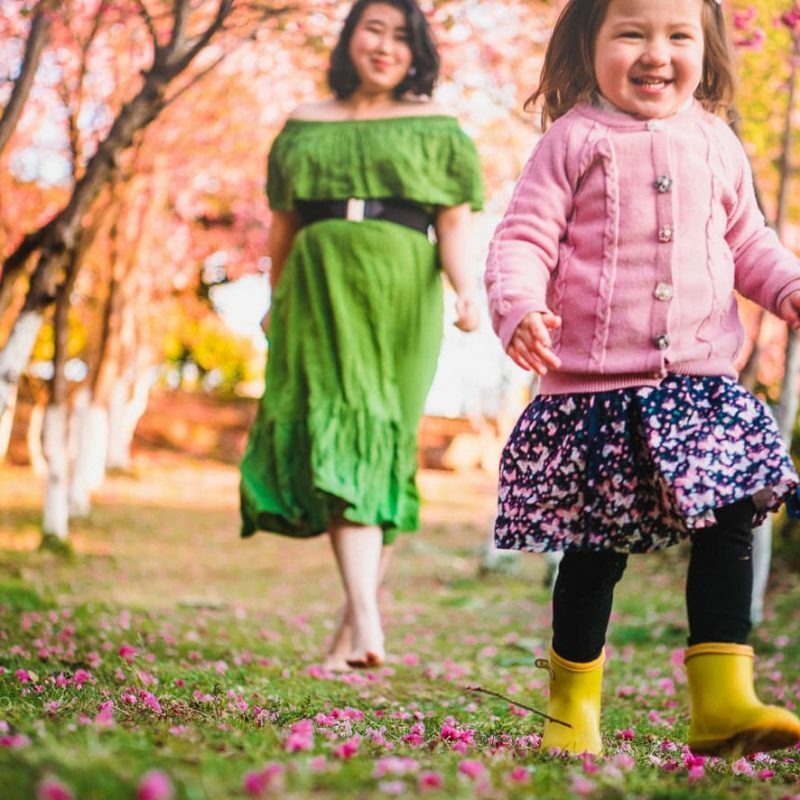 We are currently in Dali, China – a beautiful city about the size of Boston, nestled between snow capped mountains and a calm lake – and $338.93 is easily enough to rent a small apartment (as long as you rent it directly instead of using Airbnb). This still isn’t anywhere close to our final goal of $4000 a month, but darn if it isn’t encouraging! After all, we’ve only been doing this for nine months, and we only turned our first profit of about fifteen bucks in December, 2017. Of course, the best way to highlight data is visually, so here is a graph of our net income since we began Operation Digital Nomad back in August when I started keeping records. Google Adsense: This was a better than average month for our ad banners, though it is still not a significant source of income. In March, I tried out Google Auto Ads, which uses AI to automatically insert ad banners into posts. The pages with Auto Ads did indeed turn a slightly higher profit for every page view we received, but instead of the usual three banner ads that I include in each post, it inserted eight ad banners into every post, this not only makes the site less attractive, it also slows the page down. Those are both problems that turn away readers, which is simply not worth a few extra cents. I’ve removed Auto Ads and gone back to inserting the ads manually. Affiliate Sales: If you aren’t familiar with affiliate marketing or how it works, check out Operation Digital Nomad: December 2017. in which I go over some of the techniques we have been using to try to monetize. We didn’t earn quite as much from affiliate sales as we did the previous month, but what we did earn came from more diverse sources, which is a silver lining. In addition to affiliate sales from selling diaper backpacks by Idaho Jones, we also made a small commission from a certain popular online retailer whose terms of service prevent us from mentioning them by name in this post. The really nice thing about banner ads and affiliate sales is that they don’t require us to do extra work outside of writing blog posts. Photography Sales: Sales of our photographs are by far our largest income source right now. We are really grateful for every sale we make, but we know that this portion of our income is not scaleable like the others. With ads and affiliate sales, our income will continue to grow as our traffic increases (more on increasing traffic later), but image sales – even when they don’t require us to go out and do extra photo shoots – require us to spend time negotiating prices, putting up galleries and doing other legwork. That being said, we definitely plan to keep licensing our images where appropriate, as long as it is a profitable use of our time. As our other income sources become more valuable, we will change the prices of our photography accordingly so that we always spend our time in the most productive way possible. As we travel, we don’t allow ourselves to be hired by the locals for a photo shoot. In addition to taking work away from a local photographer, it is even more legwork and time away from our adventuring than image licensing. We usually make our sales in one of two ways. Sometimes, a brand will contact us and ship us a product to photograph. But more frequently, we will get a request from another publication that needs photos for a travel article. There was a time when we would agree to share our content or images free of charge in exchange for relevant links that help with our SEO, but we are getting to the point now where we always ask for payment in one form or another. As Winter gives way to Spring, people are starting to plan their Summer vacations. We have seen a dramatic uptick in organic (unpaid) search traffic pouring in from Google. To highlight how much we have improved – and how much of that change has happened recently – let’s look at this graph from Google Search Console showing the number of clicks we have gotten from Google searches since we started Operation Digital Nomad back in August. Keep in mind that when we started, travel season was already in full swing. We continued to grow right through the slow season, and now that travel is just starting to pick up again, our search traffic is exploding. The graph below shows similar results in our Google Image clicks. Amboise France in Early Summer: Tips and Photography – This is a fun post about our week in Amboise, France. I don’t know how, but Amboise somehow left us feeling incredibly relaxed despite the fact that we were always doing something. This sleepy town on a French river is one of the best places we’ve visited. 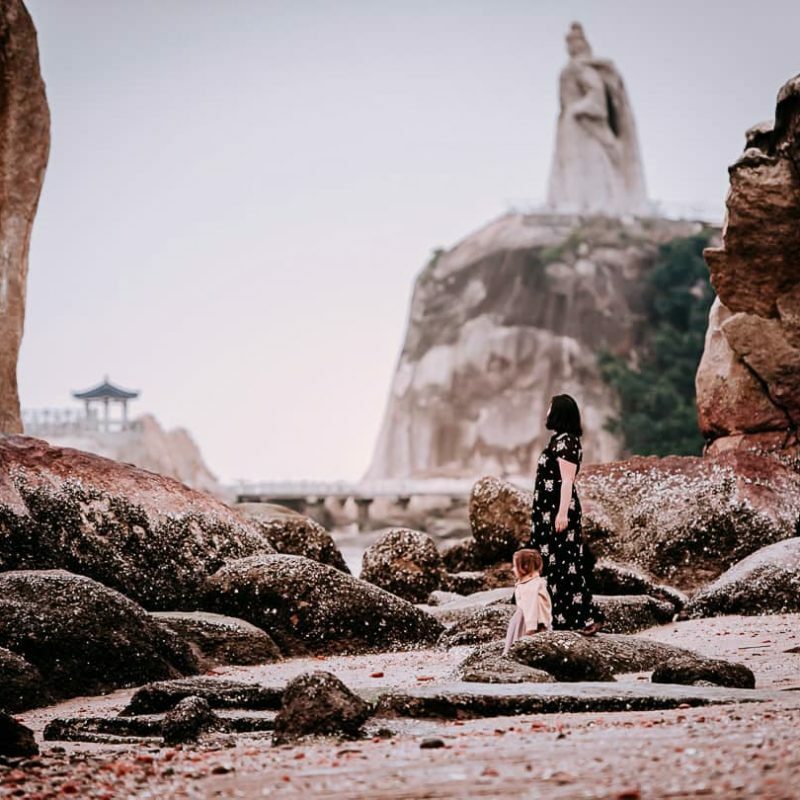 A Family Travel Photoshoot on Gulangyu Island in Xiamen, China – We don’t take a lot of full family portraits (one of us is usually holding the camera), so we thought we’d hire a local pro. We’ll have more posts about the incredibly beautiful island of Gulangyu in the future, but this post is still worth a look, even if it’s just because you forgot what I look like. Operation Digital Nomad: February, 2018 – Similar to this post, but one month older. In February’s post I discuss how we found our niche in the world of family travel blogging. Loire Valley Chateaux: Photographing the Valley of Kings – This is our guide to photographing all the Chateaux we visited while we were staying in Amboise. The Loire Valley is known for being home to over 300 castles, so this post is packed with fairy tale travel photos! Baking Lessons at the Black Dragon Cafe in Dali, China – Ok, so we didn’t take the baking lessons with the intent of writing about them – it was mostly a chance for Lisa to have fun and for us to enjoy some western-style bread. But we thought we’d do a photo dump because the lighting was really good in there and Lisa really put on a show! Review: The Babyzen Yoyo Travel Stroller – As the name suggests, this is a review of our awesome travel stroller. There are a lot of headaches that come with family travel, but the Yoyo actually solved several of them. Photographing Cherry Blossoms at Dali University in Yunnan, China – We basically picked our location in March because of its cherry blossoms. Here’s what it looks like when hundreds of trees start blossoming at the same time (and by the way, the best cherry blossom photos are yet to come, so check back soon)! Our Bad Trip to the Fisherman’s Bastion in Budapest, Hungary – This is the story of how we screwed up our visit to the otherwise beautiful Fisherman’s Bastion in Budapest. If we’re going to be giving out travel advice, you’d think we’d learn our own lessons from time to time (sometimes we do)! Review: Using ExpressVPN While Traveling – In this post, we not only explain why we chose ExpressVPN and why we like it, we also explain what a Virtual Private Network is and why it makes the internet more secure and more accessible while traveling. 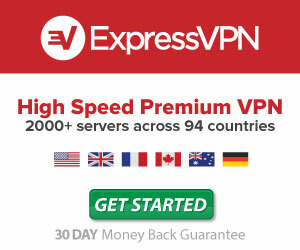 A VPN is a must, and ExpressVPN is a good choice. Baking Lessons at the Black Dragon Cafe in Dali, China (132 pageviews) – This post performed better than we could have expected. Dannie posted it to the Chinese social media site, WeChat, and it got shared by the Cafe’s owner, generating lots of extra visits. Not bad for an English language website. Review: The ErgoBaby Omni 360 Baby Carrier (80 pageviews) – This post continues to be a top performer for us. Now if more of those visitors would just buy one those awesome baby carriers. Our Experience Staying at Airbnbs in Paris (78 pageviews) – Having looked at the search queries people make before finding this post, I’m actually a little worried that they aren’t getting what they are looking for. It’s a post about our general experience using Airbnbs in Paris, but most people searched for an Airbnb apartment with a view of the Eiffel Tower. We didn’t stay in one. I’ve since added a link in this post to our most in depth post about Airbnb tips for slow travel, in the hopes that one of these visitors will find our site useful anyway. Review: The Idaho Jones Gallivant Baby Changing Diaper Backpack (64 pageviews) – In addition to buying our photos, Idaho Jones also produces stylish diaper bags. Our review of one such bag has drawn a fair amount of traffic. Amboise France in Early Summer: Tips and Photography (58 pageviews) – People must be planning trips to France because this post is doing well considering how recent it is. Fairy Glen: Family Fun on the Isle of Skye (53 pageviews) – This post from way back just started crushing on Google Image searches for the Isle of Skye (more on this later). Expect to see a lot more Scotland posts soon as we get ready for the Summer travel season. How We Took Our Best Photo of the Roman Colosseum (50 pageviews) – One of our favorite images from over a year of travel photography is still getting love from readers! We both love this image, but I’m thinking about revamping the article anyway to make it more concise and more helpful. We’d love some feedback if anyone has thoughts on making it better. Review: The KidCo Peapod Plus Travel Tent (47 pageviews) – This travel tent was Lisa’s bed for almost a year of travel in Europe. She’s since grown out of it, but we think it’s one of the best options out there for traveling with a baby. Loire Valley Chateaux: Photographing the Valley of Kings (44 pageviews) – It would be hard to see this headline and not want to click on it. This post has done pretty well considering it’s too new to generate much google traffic. Where to Photograph Provence Lavender Fields (42 pageviews) – This article is from February, but it drew a lot of views this month. As June approaches, I expect to get a lot more readers who want to photograph Lavender. We tried to make this into the post we wished we’d had while we were in Provence. Some posts on the other hand might be interesting to us, and to our more loyal readers, but they generally aren’t exciting for new audience members who just want to find out where a particular photo was taken or whether a certain travel stroller actually fits in an overhead compartment on a plane (it does!). Posts about baby milestones and family bonding are vital to our relationship with our readers, and to our sanity, but they are pretty hard to optimize for search. We’re going to keep doing them anyway. 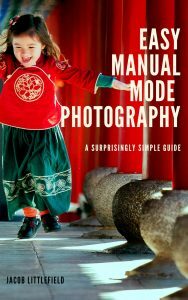 Because we are photographers, we knew that images were going to play a big role in our travel and in our blog. We expected our images to help our posts stand out and to improve the reading experience for viewers. What came as a surprise was how directly the photos in our blog posts generated traffic. It’s generally agreed that images, properly named and tagged with keywords, can improve search rankings for a page in a general web search. But thanks to Google Images, the photos we post are sometimes displayed directly to searchers. The other way that our images might get in front of viewers is right in a regular web search. Google doesn’t always display images in its search results, but it does when it thinks it has a really good match for your search. Only a few results are displayed, so this is very competitive real estate. 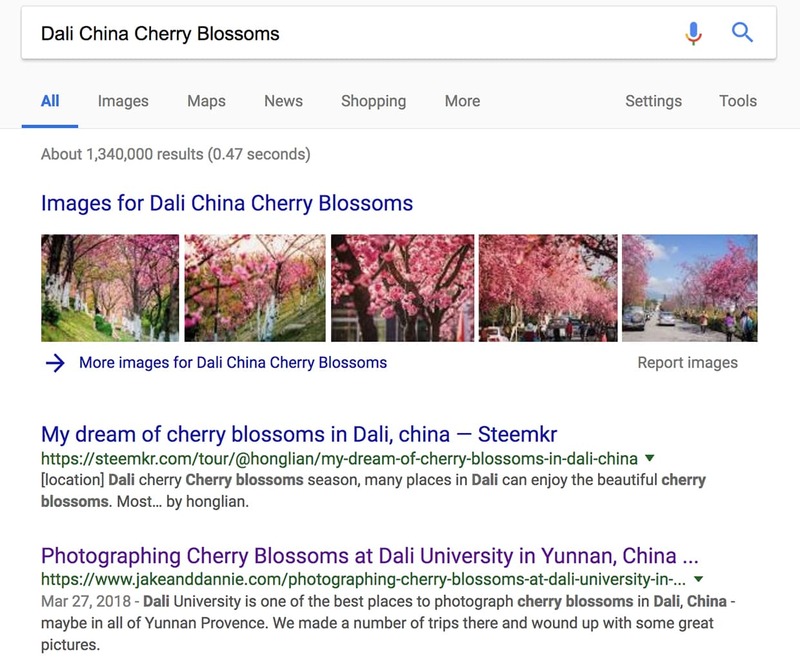 Usually we are still too small to show up in very popular searches like “Paris,” but for more specific searches, like “Dali China Cherry Blossoms” we show up really well; the first four images displayed in the screenshot below are from our Dali University cherry blossom post. Google doesn’t pick every photo in your post to display in an image search. It doesn’t pick your favorite, either. It picks the image that it thinks will best represent whatever post it thinks best represents the results that the searcher is looking for. That means it is considering whether the post that features the image is relevant, and it is then trying to figure out which image or images in that post epitomize the search result. It won’t be long before artificial intelligence is good enough to look at nearly any image and figure out what’s in it. In the meantime, here are some factors that are taken into consideration by Google when choosing images, and how we try to stand out. 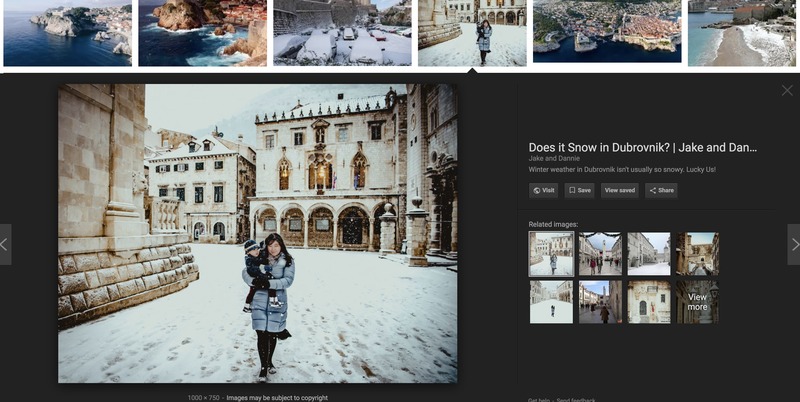 Post URL and Title: Because the image in the search results is intended to be a window to useful content, Google wants to make sure that the post itself is on topic. That’s why images do much better when the search terms are in the title of the post. There’s always a temptation to get creative with the post titles, but I find that in general, it’s better to be as literal, descriptive and specific as possible. That’s why we have so many posts with titles like “Photographing the Old Man of Storr on Scotland’s Isle of Skye. We try to hit as many location keywords as possible since most of our readers are travelers looking for images of a potential destination. Surrounding Content: Once Google Images knows which post it wants to display, it has to choose an image. One thing it looks at is the content surrounding the image. If the sentence before and after the image include the keywords from the search, then there is a reasonable chance that the image is on topic. So don’t just scatter you images willy nilly through the post. Make sure the images line up with the words, and if possible, avoid having more than a few photos in a row so that every image has content to be associated with. Image Filename: The filename is another cue that can tell the algorithm what is in the image. 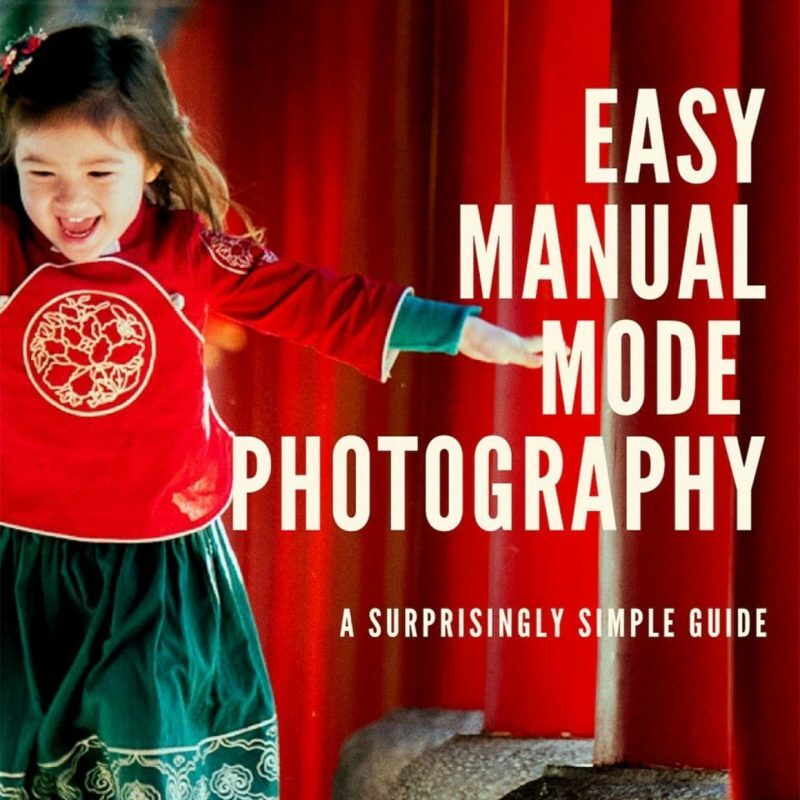 We used to name all of our images after the post title followed by a number sequence. But Google wants to figure out which single image (or occasionally two or three) images are exactly right. Giving every image the same name can backfire because it confuses the algorithm. On a number of our older posts, I’ve done searches myself and seen that the image google chooses isn’t really the best one for driving traffic. Maybe someday if I have a whole week of free time I’ll go back and re-upload the older images with better filenames, but in reality I’ll probably just have to live with the flaws. Now when we export our photos I name each one individually, using photo specific keywords that will help search engines sort them out. Image Alt Text: The alt text is supposed to be a description of the image that will be read out loud by a browser for seeing impaired visitors or people who don’t allow images to be displayed for whatever reason. But because they are meant to be descriptive they are also a good way for the algorithm to figure out what it’s looking at. It’s best to use natural language and literally describe what is in the photo, preferably using keywords that you think someone might search for. Image Caption: You don’t want to use a caption in every photo because it makes the page look cluttered and I’ve read that it might actually hurt SEO. I never used to use captions at all, but now I put helpful captions on my favorite images in a post. If I think the image is the epitome of a likely search keyword I will just use that keyword as a caption (ie, “Lavender in Provence”). If I think a photo isn’t likely to do well in search results or drive traffic, but I think it could use a little more information or a funny comment, I might stick that in there instead. But like I said, I don’t put captions on every photo, especially in a post with lots of images where the caption would get very repetitive (ie, “More lavender in Provence”). Image Quality and Relevance (As Measured in Clicks): Google has a few more tricks up its sleeve. It knows which images are getting clicked on, so it displays a certain image in the 100th position and that image gets clicked on 50% of the time, it might move that image up. Likewise, if it displays an image early in the search results but no one ever visits the site, it is likely to get demoted. This is where it helps to keep in mind the number one rule for SEO of all kinds: try to please the user, not the algorithm. Even though you are thinking about keywords, you also need to think about what a user is looking for when they use those keywords, and try to make sure that all the factors above are optimized for that need. It’s also important to make sure that the content they get when they click through is consistent with what you are putting out there in the caption, the alt text, etc. If someone clicks through but then returns to the search result page to look for something else, Google knows that people using those keywords didn’t find everything they were looking for on your page. Be honest and realistic. We took a lot of photos on the Isle of Skye during our time camping in Scotland. Of all the places we visited, I thought that the Old Man of Storr was the most beautiful. But interestingly, our post about photographing that amazing mountain and its rock formation get very little traffic. The post from Skye that does really well on Google Images is Fairy Glen: Family Fun on the Isle of Skye. There’s no accounting for taste, of course, but I’m going to make a claim here: The photos from our Storr hike are objectively better than our photos from our trip to Fairy Glen. The scenery is better, Dannie and Lisa are dressed better, and I planned the composition more carefully. I even think Dannie Did a better job editing the Old Man of Storr photos. This image above is my favorite. I love how the jagged rocks are partially obscured by the clouds. We had to hurry once the clouds rolled in to get the shot before it was totally swallowed up. My favorite part is how well Dannie and Lisa blend in with the scenery. Normally I like them to “pop,” but I love how you could look at this photo for a few minutes without seeing them, then finally notice their shapes among the rocks and grass – a little surprise that completes the viewing experience. This photo doesn’t just do well on searches for Fairy Glen. 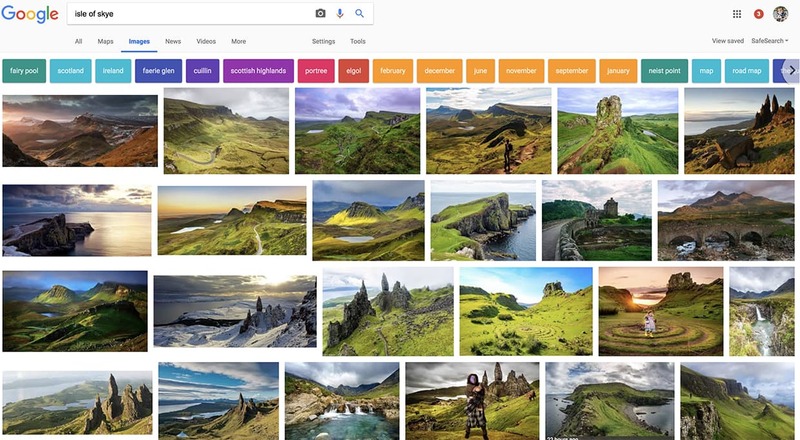 I just checked, and it ranked 17th in a search for “Isle of Skye!” That’s half the reason it’s driving more traffic to our blog than any other (superior) photo we’ve taken. Don’t get me wrong; I like this photo. Lisa looks adorable, and the scenery and the lighting are great. We even used that lantern as a fun prop to make it more interesting. I just thought it wasn’t as dramatic as Storr (or my favorite images of the Colosseum or the Eiffel Tower). But like I said, no one online cares what I like. I used location keywords in the URL, the alt text and the content. But I also did the same for all the other images we’ve posted in the last year, so that can’t be everything. The image matches the keywords. It is in fact a picture of the Isle of Skye, specifically, Fairy Glen. 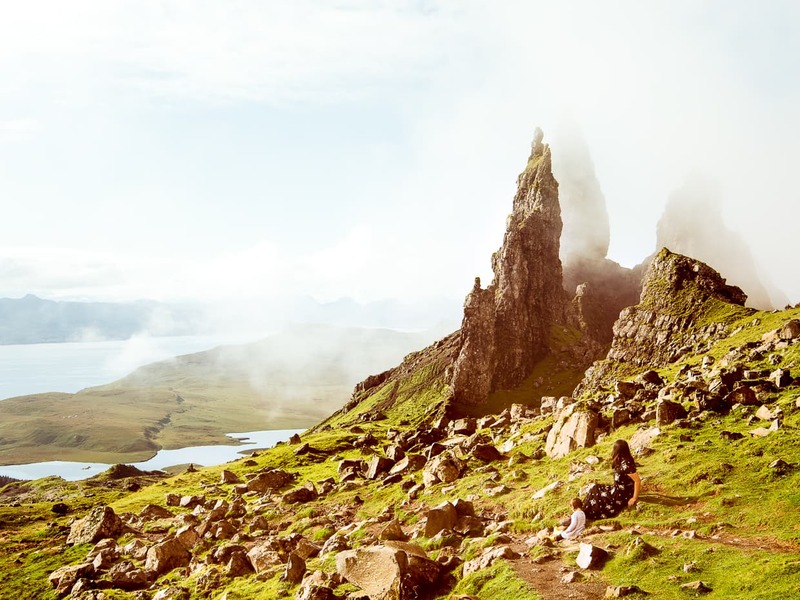 The same is true of the Storr photos, but one big difference is that the Fairy Glen post is a helpful guide to the location, whereas the Storr post is more of a narrative about our experience hiking and photographing the mountain. I feel like it’s a compelling story. But much in he same way that no one online cares which photos are my favorite, no one is searching the internet for what’s going through our heads while we walk up a muddy mountain. The post still serves a purpose, giving our blog a personal touch for our most devoted readers. It just doesn’t fill the kinds of search needs that Google is best for. 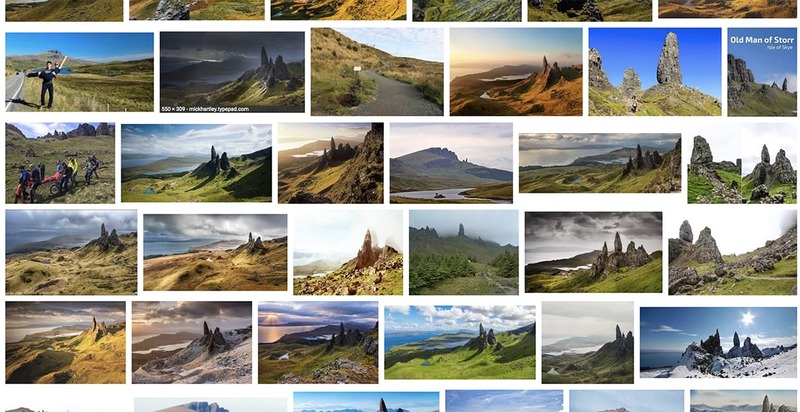 In reality, the Storr image does show up in Google Image results for “Old Man of Storr.” Here is a screenshot of those search results. Can you see our image there in position 51? How meta would it be if this screenshot showed up in Google Image search results? Neither can anyone else. Because the Old Man of Storr rock formation looks best from a certain angle, and because it is a pretty easy hike (unless you are carrying a toddler), many people have taken similar images. Not only are all the other photos displayed here very similar to ours in composition, the clouds that made the image magical for me, and the editing style Dannie used to create the perfect look for our post, actually make the image disappear in a sea of higher contrast photos. It’s way down the page and nobody is going to click on it. The majority of the photos are still of the Old Man of Storr, but there’s our Fair Glen photo with those big rings and Lisa’s bright lantern, jumping off the page. There are a couple other photos of Fairy Glen, perfectly nice photos too, but in color and style they are very similar to the the rest of the photos. With the possible exception of that one picture of the guy dressed like Braveheart, I don’t think any of them draw the eye like ours. 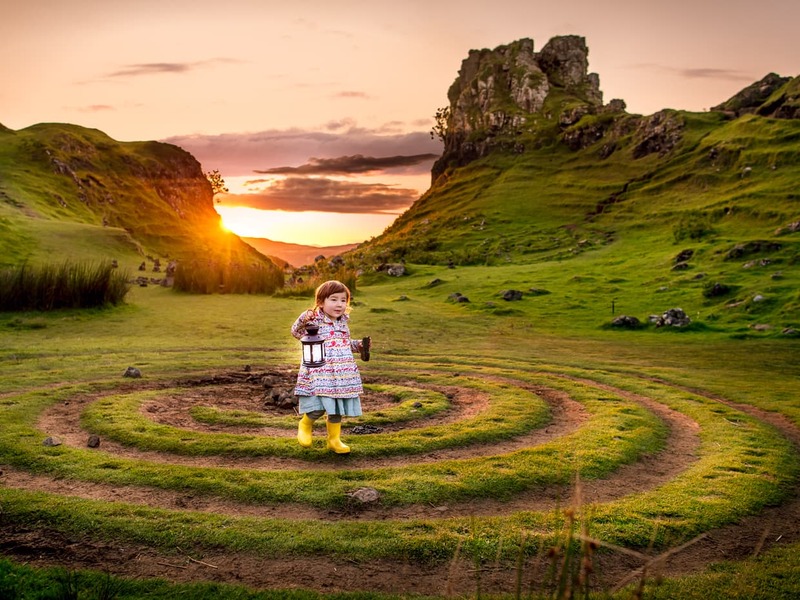 People who want a sampling of images from the Isle of Skye are choosing between dozens of pictures of Storr and just one great photo of Fairy Glen. That’s why I think it gets clicks. The readers then get a useful post, and Google takes note and moves the picture higher in the rankings. So here’s how we’re going to use this example to make our photos perform even better in Google Images than they already are. Captions, Alt Text, Etc: Not only will we continue to use meta data like alt text and image titles to describe our photos, we’ll also try to get more specific with our post topics so that its easier to sync the post level keywords with the image level keywords. Revamping Our Old Posts: A little bit at a time we can go back to our older posts and make sure that all of our Image SEO is up to par. We have some great photos from earlier in our travels, and even before, that could be drawing a lot more traffic than they are. They need better keyword optimization, and we didn’t even start using captions until last month. It will be tedious work, but over time, it could yield us thousands of extra page views. Planning Our Photo Shoots: We always put at least some level of planning into our photos, and we try our best to make them our own. But one thing we could do is look at a Google Image search result page before we set out and try to create compositions and styles that will draw the eye, even among many other photos of the same site. We already succeed in this a lot of the time just because we have fun being creative, but putting conscious thought into how the photos will look in search couldn’t hurt – so long as we still have fun doing it. As always, I want to thank you for reading Operation Digital Nomad, and all of the other articles we work on so hard. We were optimistic when we started this project, and though we have miles to go before we reach our goals, we are progressing faster than we had dared to hope. The credit for this success goes to our readers and everyone else who has supported us, advised us, or inspired us on our journey. Like they say: “To go fast, travel alone. To go far, travel together.” Thank you for being our companion on the biggest adventure of our lives. If you would like to support us, consider checking out the products and services we recommend on our resource page (it looks better now! ), and don’t forget to sign up for our newsletter.